Black skin patches on dog. My dog started developing patches on his side a few months ago. His hair is falling out in these patches and the skin appears to look dry, scaly, red and sometimes bleeding. It doesn't appear to hurt or bother him. He's currently not on any medications. The most recent patch looks quite large like the size of two quarters side by side. Some older patches look like hair is growing back. Is there an ointment or something I can put on it? Is this an allergy? Are these patches symmetrical? Or, in other words is there one on either side? If so, this may be something called flank alopecia (also called seasonal alopecia). We often don't know the cause for flank alopecia. It is common in boxer dogs but it can happen in any breed. While some people will try treating it with melatonin, it's debatable whether this works. I usually don't do any treatment and it gets better on its own within a few months. Flank alopecia is not itchy. If this is an itchy spot then it will be something else. A fungal infection could potentially look like this, but my money would really be on flank alopecia. If this is itchy then I would have your vet look at it. If it is some type of infection then Sammy would need a prescription medication, most likely in the form of tablets in order to get better. There won't be a cream that will help. Some dogs with hypothyroidism can have skin that looks like this. But this is not common. If it is not bothersome to Sammy then it's probably ok to keep an eye on him for now. Otherwise it's good to have your vet take a look. It's not symmetrical. In fact, the patches are only occurring on side of him. 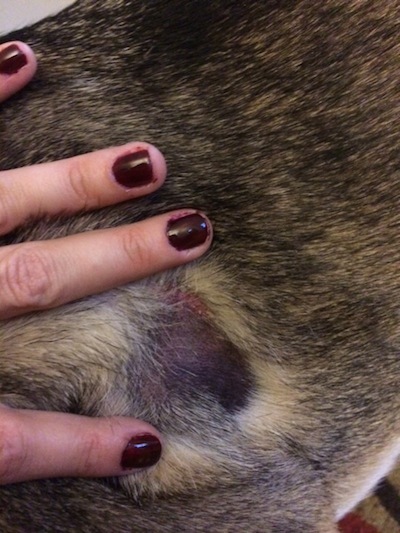 Seasonal alopecia still can happen to a dog even if it is not symmetrical. However, if there are a lot of spots then it is probably a good idea to have your vet take a look.